Konstantin Petrovich Pobedonostsev (Russian: Константи́н Петро́вич Победоно́сцев; IPA: [kənstɐnˈtʲin pʲɪˈtrovʲɪtɕ pəbʲɪdɐˈnostsɨf]; May 21, 1827, Moscow – March 23, 1907, Saint Petersburg) was a Russian jurist, statesman, and adviser to three Tsars. He was the chief spokesman for reactionary positions. He was the "éminence grise" of imperial politics during the reign of Alexander III of Russia, holding the position of the Ober-Procurator of the Most Holy Synod, the non-clerical official who supervised the Russian Orthodox Church. 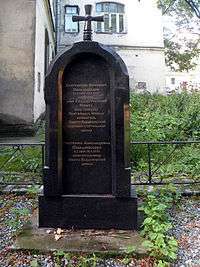 His writings on politics, law, art, and culture emphasized the positive element of the spiritual and secular unification of Russia with the acceptance of Christianity. He warned of the negative element in Russia, portraying democratic and liberal movements as enemies to the national and religious unity of Russian people. Achieving the harmonious society, said Pobedonostsev, meant there was a collective responsibility to uphold political and religious unity, hence close supervision of Russian behaviour and thinking was a necessity. Pobedonostsev's father Pyotr Vasilyevich Pobedonostsev was a Professor of literature at Moscow State University. In 1841 he placed his son, then aged 14, in the St. Petersburg School of Jurisprudence, which had been established to prepare young men for civil service. 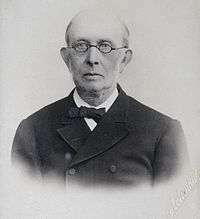 After graduation Konstantin Pobedonostsev entered the public service as an official in the eighth Moscow department of the Senate. The task of the department was to resolve civil cases from guberniyas surrounding Moscow. He was promoted rapidly within the eighth department. From 1860 to 1865 he was professor civil law at Moscow State University. In 1861 Tsar Alexander II invited him to instruct his son and heir Nicholas in the theory of law and administration. In 1865 young Nicholas died, and Pobedonostsev was invited to teach Nicholas's brother Alexander (the future Tsar Alexander III). In 1866 Pobedonostsev moved to a permanent residence in St. Petersburg. Pobedonostsev and Tsarevich Alexander remained very close for almost thirty years, from Alexander's ascension as a Tsar until his death in 1894. He became a member of the Council of the Empire, and in 1880 – chief procurator of the Holy Synod. In the latter office Pobedonostsev was operating head of the Russian Orthodox Church. During the reign of Alexander III he was one of the most influential men in the empire. He was the mastermind of Alexander's Manifesto of April 29, 1881. The Manifesto on Unshakeable Autocracy proclaimed that the absolute power of the Tsar unshakable thus putting an end to Loris-Melikov's endeavours to establish a representative body in the empire. Actually, Pobedonostsev's ascension in the first days after the assassination of Alexander II resulted in subsequent resignation of Loris-Melikov and other ministers eager for liberal reforms. He always was an uncompromising conservative and never shrank from boldly expressing his staunch opinions. Consequently, in the liberal circles he was always denounced as an obscurantist, pedant, and an enemy of progress. After the death of Alexander III, he lost much of his influence. Tsar Nicholas II adhered to his father's Russification policy and even extending it to Finland, but he generally disliked the idea of systematic religious persecution, and was not wholly averse to the partial emancipation of the Church from civil control. In 1901, Nikolai Lagovski, a supporter of socialist ideas, tried to kill Pobedonostsev, shooting through the window of Pobedonostsev's office, but missing. Lagovski was sentenced to 6 years of katorga. 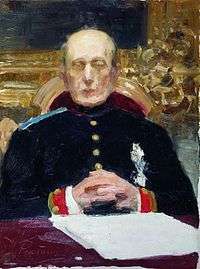 During the revolutionary tumult, which followed the disastrous war with Japan, Pobedonostsev, being nearly 80 years of age, retired from public affairs. He died on March 23, 1907. He was fictionalized as old senator Ableukhov in Andrey Bely's novel Petersburg (1912). Arguably he was also depicted in Leo Tolstoy's Anna Karenina as Alexei Alexandrovich Karenin. He ordered Tolstoy's excommunication in 1901. Though Pobedonostsev is mostly known as statesman and thinker, his contribution to Russian civil law is significant. He is generally regarded as one of the most educated European jurists of the 19th century. His main work was the three-volume "Course of Civil Law" (Курс гражданского права) published in 1868, 1871 and 1880 respectively. Before the 1905 "The First Revolution" the Course was reprinted several times with minor changes. The Course was regarded as outstanding guide for practising lawyers. Quotations from the Course are reported to have been used as a ground for decisions of the Civil Board of the Senate. The author's profound knowledge of Russian civil law resulted in description of many previously insufficiently explored institutions such as communal land law. In addition, Pobedonostsev published in 1865 in Moskovskie Vedomosti several anonymous articles on the judicial reform of Alexander II. Pobedonostsev held the view that human nature is sinful, rejecting the ideals of freedom and independence as dangerous delusions of nihilistic youth. In his "Reflections of a Russian Statesman" (1896), he promoted autocracy and condemned elections, representation and democracy, the jury system, the press, free education, charities, and social reforms. He despised representative government, and denounced the notion of an all-Russian Parliament. He also condemned Social Darwinism as erroneous generalisation of Darwin's Theory of Evolution. In the early years of the reign of Alexander II, Pobedonostsev maintained, though keeping aloof from the Slavophiles, that Western institutions were radically bad in themselves and totally inapplicable to Russia since they had no roots in Russian history]and culture]and did not correspond to the spirit of Russian people. At that period, he contributed several papers to Alexander Herzen's radical periodical Voices from Russia. He denounced democracy as "the insupportable dictatorship of vulgar crowd". He argued that parliaments trial by jury, freedom of the press, and secular education were undesirable alien nostrums. He subjected all of them to a severe analysis in his Reflections of a Russian Statesman. He once stated that Russia should be "frozen in time", showing his undivided commitment to autocracy. To these dangerous products of Western thought he found a counterpoise in popular vis inertiae, and in the respect of the masses for institutions developed slowly and automatically during the past centuries of national life. In his view, human society evolves naturally, just like a tree grows. Human mind is not capable to perceive the logic of social development. Any attempt to reform society is a violence and a crime. Among the practical deductions drawn from these premises is the necessity of preserving the autocratic power, and of fostering among the people the traditional veneration for the ritual of the national Church. In the sphere of practical politics Pobedonostsev exercised considerable influence in the Russification policy of Alexander III. This found expression in an administrative nationalist propaganda. Pobedonostsev particularly advised the anti-Jewish measures taken during Alexander III's administration. These began with the temporary "May Laws" that banned Jews from rural areas and shtetls even within the Pale of Settlement. The May Laws did not lapse; further policies led to deportations of Jews from large cities, enrolment quotas in public education, and a proscription against voting in local elections. Pobedonostsev was not always a reactionary. He had originally welcomed the Great Reforms that Tsar Alexander II undertook in the 1860s-1870s. However he soon became alarmed by the weakening of the rural estates and the tsarist bureaucracy. He decided that a deeper spiritual unity of the tsar and his people was needed to restore stability to Russia. When Alexander III ascended the throne in 1881, Pobedonostsev rapidly gained a powerful influence over the affairs of both church and state. To establish order he suppressed all reform efforts. The reforms of the 1860s had legalized the role of Protestant and other non-Orthodox religions. Pobedonostsev said Russia needed an Orthodox monopoly. However he failed to win over the civil authorities, the judicial authorities, and the religious department in his struggle against the non-Orthodox. As a result his policies, which were intended to unify, actually engendered dissension and violence and in the long run contributed to the collapse of the Russian empire. Pobedonostsev did develop a social program for the Church while limiting its autonomy. He imposed repressive measures against the non-Orthodox. He carried out major Church reforms, but they resulted in a church that by 1900 was enmeshed in bureaucracy, alienated in many ways from society, resentful of secular authorities, and divided internally. Stagnation in church and state policies prevailed until Pobedonostsev retired in 1905. In the long run, argues Polunov, Pobedonostsev's attempts to impose safe conservative barriers to reform and his hostility toward innovation served only to weaken the autocratic state from within. Reflections of a Russian Statesman by Konstantin Petrovich Pobedonostsev. Published by G. Richards, 1898. University of Michigan Press. 1964. ISBN 0-472-06104-6. "Russia and Popular Education," The North American Review, Vol. 173, No. 538, Sep., 1901. ↑ John Basil, "K.P Pobedonostsev and the Harmonius Society." Canadian-American Slavic Studies 37.4 (2003): 415-426. ↑ Толстая, Софья Андреевна (2011-02-04). My Life. University of Ottawa Press. ISBN 9780776619224. ↑ Pobedonost͡sev, Konstantin Petrovich (1898-01-01). Reflections of a Russian Statesman. G. Richards. ↑ Arnold White (Jan 1904). "The Jewish Question: How to Solve It". The North American Review. 178 (566): 10–24. .
↑ John D. Klier (2001). "State Policies and the Conversion of Jews in Imperial Russia". In Robert P. Geraci; Michael Khodarkovsky. Of religion and empire: missions, conversion, and tolerance in Tsarist Russia. pp. 92, 106–107. ISBN 080148703X. ↑ Leo Errera (1894). The Russian Jews: Extermination or Emancipation?. transl. Bella Loewy. London. , 18. ↑ Virginia Cowles (1977). The Last Tsar and Tsarina. , 25. ↑ A. Iu. Polunov, "The State and Religious Heterodoxy in Russia (from 1880 to the Beginning of the 1890s)." Russian Studies in History 39.4 (2001): 54-65. ↑ A. Iu. Polunov, "Church, Regime, and Society in Russia (1880-1895)." Russian Studies in History 39.4 (2001): 33-53. ↑ A. Iu. Polunov, "Konstantin Petrovich Pobedonostsev—Man and Politician." Russian Studies in History 39.4 (2001): 8-32. This article incorporates text from a publication now in the public domain: Chisholm, Hugh, ed. (1911). "Pobêdonostsev, Constantine Petrovich". Encyclopædia Britannica. 21 (11th ed.). Cambridge University Press. Basil, John D. (1995) "Konstantin Petrovich Pobedonostsev: An argument for a Russian state church." Church history 64#1 (1995): 44-61. Basil, John D. "K.P Pobedonostsev and the Harmonius Society." Canadian-American Slavic Studies 37.4 (2003): 415-426. Basil, John D. Church & State in Late Imperial Russia: Critics of the Synodal System of Church Government (1861-1914) (2005). Byrnes, Robert (1968). Pobedonostsev: His Life and Thought, Indiana University Press, a standard scholarly biography. Stavrou, Theofanis (1969). Russia Under the Last Tsar. University of Minnesota Press. ISBN 0816605149, ISBN 9780816605149. Courtney, W.L. (1904). "A Reactionary Statesman." In: The Development of M. Maeterlinck. London: Grant Richards, pp. 163–172. Polunov, A. Iu. "The State and Religious Heterodoxy in Russia (from 1880 to the Beginning of the 1890s)." Russian Studies in History 39.4 (2001): 54-65. Sorenson, Thomas Calnan (1978). The Thought and Policies of Konstantin P. Pobedonostsev, University of Washington. Wikimedia Commons has media related to Konstantin Pobedonostsev.